Joanna hits it out of the park with patterns inspired by L.M. Montgomery's classic books. 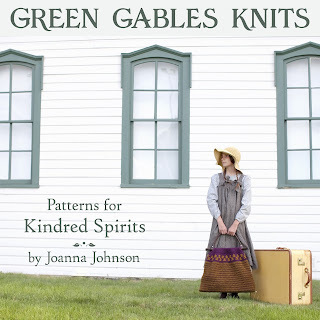 My friend Joanna (of Phoebe's Sweater fame) decided last year to publish a sweet little book based around Anne of Green Gables. As a child of the 80s, I have a long and storied history with not only the 6 books, but also the made-for-TV movies. At my house, the Megan Follows movies reigned supreme; I generally preferred Anne of Avonlea to Green Gables, but both were watched overandoverandover with much love. Naturally, when I first heard from Joanna that she was planning a Green Gables book, I expressed so much enthusiasm over the idea that I was one of the first to receive a signed, bound copy. The gorgeous photos alone are worth the cost of the book; mine is sitting on the coffee table! I've been envious of natural redheads for as long as I can remember. Anne played a big part in creating this obsession, and I was always confounded that she was wishing away her beautiful auburn locks in exchange for Diana's raven ones. Since I wear the same raven curls as Diana, I was immediately drawn to the Diana's Hat pattern in the book. I reached for my needles and whipped one up in an afternoon and a half. ...while blue alpaca adorns the crown. I really enjoyed knitting this simple pattern, and am quite delighted with the results. The size is just right to accommodate my curls without being too large, and the extra-large circumference of the brim rests just perfectly on your head without giving you "hat hair" when the hat is removed. If you're an Anne fan, like me, or just a fan of beautiful, wonderfully photographed knits, this book is a must have. And best of all, you can purchased a signed copy directly from Joanna for just $14.95. Well done, Joanna! I'm hoping you'll consider a sequel...perhaps some knits inspired by Anne's days and acquaintances as a schoolteacher in Avonlea?